As life expectancy increases and population ages, the already enormous impact of neurodegeneration on society will become even larger without better prevention and treatment. Developing strategies to prevent degeneration of neurons and to promote a healthy nervous system is, thus, critical. The development of pharmacological agents that would increase production of new neurons was recently facilitated by the identification of the hormonal regulators of various steps of adult neurogenesis. 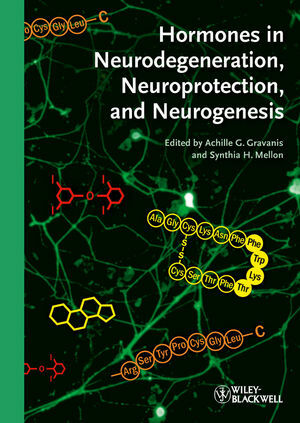 The proposed book is writen by a group of top world experts involved in the study of the mechanisms of hormonal control of brain damage and repair. The effects of thyroid and steroid hormones (estrogens, androgens, progestins, gluco-mineralo-corticoids, various neurosteroids) or polypeptide hormones (CRF, urocortins, somatostastin, GH/IGF, leptin, prolactin, PACAP, erythropoetin) on neuronal survival and neurogenesis in various neurodegenerative conditions and in brain aging will be discussed in detail. The proposed book is unique because it gives a comprehensive account of the neuroprotective and neurogenic effects of steroid and polypeptide hormones. Furthermore, new pharmacological approaches for treatment of neurodegenerative conditions are presented, based on the neuroprotective and neurogenic properties of natural and synthetic hormones. Dr. Achille Gravanis is Professor in the Department of Pharmacology, School of Medicine, University of Crete, Greece. He obtained his Pharmacy Diploma from the University of Athens, and his PhD in Pharmacology from the University Paris 6. Achille Gravanis worked as a researcher in Mount Sinai School of Medicine, New York. He participated as a member and Chairman of many research committees of the European Union, Elected Member of the Fellowships Committee of FEBS, External Reviewer Panel LS5, European Research Council, Member of the Editorial Board and Reviewer of many international scientific journals. His research focuses on the role of hormonal micro-environment in neurodegenerative diseases and the development of micromolecular neuroprotective and neurogenic compounds. Dr. Synthia H. Mellon is Professor in the Department of Obstetrics, Gynecology and Reproductive Sciences, The Center for Reproductive Sciences, School of Medicine, University of California, San Francisco. She received her PhD in Biochemistry from Columbia University, New York, and postdoctoral training in the Department of Medicine at the University of California, San Francisco. Synthia Mellon was awarded the Richard E. Weitzman Memorial Award from The Endocrine Society, was President of Women in Endocrinology, and is a Fellow of the American Association for the Advancement of Science. She has been a member of numerous Editorial Boards and review committees, and has served as a reviewer for numerous scientific journals. Her research focuses on the developmental regulation of steroid hormone production, and the role of neurosteroids in developmental and neurodegenerative disorders of the nervous system and in the etiology of neuropsychiatric disease.